Planning on catch up with some missed VR games over the Christmas break? Bad news; there’s more Beat Saber to play instead. Beat Games yesterday teased that it has some ‘Christmas gifts’ on the way to the ever-popular rhythm action game, which will arrive ‘earlier than you might think’. No word on exactly what these gifts are but the studio does say they’ll be available on all platforms, and not just debuting on PSVR or PC VR. The smart money is on these being some new tracks to dig into, perhaps with a festive theme. No doubt a lot of VR fans are going to be showing relatives Beat Saber this Christmas so it’s a good opportunity to give them a reason to dive back in. Given that these features are coming to all platforms you can probably rule out long awaited PC-exclusive features like the track editor and multiplayer support. Those are still coming but we wouldn’t expect them until sometime in 2019 at this point. We also wouldn’t expect any surprise ports to Oculus Go or other platforms. Whatever it is we’d guess the news will be revealed in a matter of days. The post Beat Saber Teases ‘Christmas Gifts’ Coming To All Platforms ‘Earlier Than You Think’ appeared first on UploadVR. It may be one of our most anticipated VR titles of 2019, but Innerspace’s A Fisherman’s Tale is a hard game to explain. Thankfully, this effective new 360 degree trailer does it for us. The video, dubbed ‘The Storm’, arrives via co-producer Arte as publisher Vertigo Games confirms a January 22nd launch date for the experience. This offers just a taste of the larger experience, taking footage from the prologue and scenes that separate the game’s main levels. Fair warning; much of this story is delivered within the game itself and it might be best to save the discovery for then (it’s not that much longer to wait!). You can watch the trailer in VR by jumping into the YouTube app on the broad range of compatible devices like Daydream, Oculus Go and PSVR. We recently went hands-on with A Fisherman’s Tale for the second time and came up with a list of reasons as to why it’s one of the VR games we’re most excited about in the new year. The post A Fisherman’s Tale Gets Cool 360 Intro As Final Release Date Confirmed appeared first on UploadVR. Launch Date Confirmed for A Fisherman’s Tale, New 360 Video & Screenshots Released The puppet puzzler is due out next month. Titanic VR Developer VR Education Release Learning Platform ENGAGE Nokia has already begun using the ENGAGE platform for training and educational purposes. Back in May, we reported that SoulKeeper VR developer HELM Systems was working on a ‘very different’ version of its fantasy RPG that would release as an ‘Early Access 2.0’ build. The studio then went back to radio silence but, this week, it’s finally ready to show us what that really means. HELM just launched the below trailer for The SoulKeeper VR 2.0 and it’s a pretty impressive sight. The game retains the impressive visuals that we first praised it for back in 2017 but there’s now a new open world to discover. Simply put it looks like a Skyrim game that’s actually made for VR, complete with dungeons to explore, NPCs to interact with and what looks like a lot of river traversal. Dare we say it looks like an entirely new game. We’ll have to wait to see how deep these changes really go, though. HELM is promising a beta testing period next year and weekly Twitch streams to showcase progress beginning next month. A real date for the update has not yet been revealed. The post SoulKeeper VR’s Stunning 2.0 Trailer Looks Like A Skyrim Made For VR appeared first on UploadVR. Supermassive Games is bookending the year in VR in much better form than it started. The Until Dawn developer’s first two games of 2018, PSVR’s The Inpatient and Bravo Team, have all but been forgotten following an unexpectedly lukewarm reception that led the team to vow it will do better in the future. Rest assured; Shattered State is better. Launching today, Shattered State is the result of Supermassive’s first VR collaboration outside of Sony, this time appearing exclusively on Google’s Daydream platform. If you’ve been following Daydream’s exclusive output over the past few years you’ll know Google has been favoring more experimental VR experiences like So Let Us Melt to showcase its mobile ecosystem. Shattered State is very much a continuation of that trend; it’s a political thriller in which you’re not on the frontlines of conflict but instead behind a desk, calling the shots. Shattered State is definitely less game, more choose your own adventure. Lasting about 40 minutes as one ‘play through’ but reaching much further thanks to the developer’s staple multi-choice formula, the game is like a distillation of everything that Supermassive is best known for squeezed into something around the length of a TV episode. Set in the wake of the creation of a new country, already uneasy tensions accelerate at an alarming pace as you try to put a stop to what’s looking increasingly like a coup. That means lots of important people with important jobs shouting various options at you, usually conflicting with a colleague and leaving you with the consequences. We’ll have a full review for you in the near future but I was really struck by what Supermassive was trying to do here; create a VR experience the likes of which you genuinely won’t have seen in traditional gaming before. There’s an admirable element of stagecraft to the way in which characters bounce off of each other, stare you down and enter and exit scenes. The post Until Dawn Dev Supermassive Returns To VR With The Experimental Shattered State appeared first on UploadVR. Supermassive Games Launch Daydream Exclusive Shattered State VR innovators Supermassive Games move from PlayStation VR to mobile headsets. A regulatory filing confirms what’s been clear for some time — the IMAX VR experiment is over. We first set eyes on IMAX VR’s efforts early last year with its well-equipped pods featuring HTC Vives and an early StarVR prototype we noted lacked the smoothness expected from a paid VR experience. The location was also separated from a theater multiplex so it was unlikely to get much foot traffic — an odd choice for the premiere location of the IMAX brand of VR arcades. We’ve reported on earlier closures, but this latest filing is the nail in the coffin for IMAX VR. 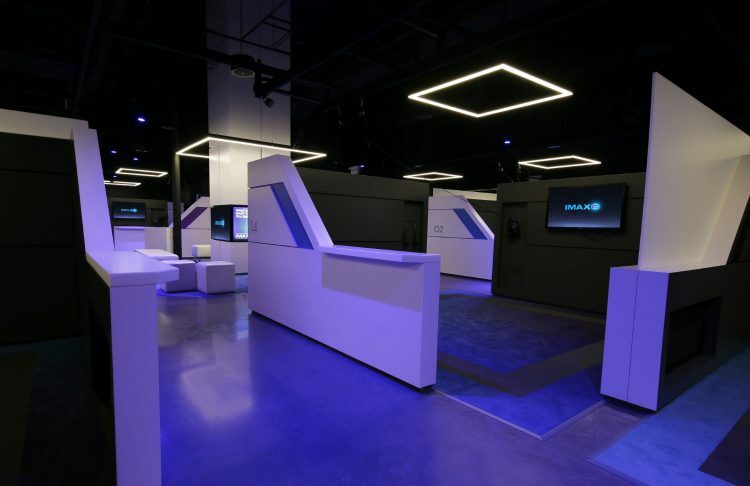 In connection with the Company’s previously-announced strategic review of its virtual reality pilot initiative, the Company has decided to close its remaining VR locations and write-off certain VR content investments. Many of the virtual worlds IMAX VR embraced for selling tickets were readily available on home VR systems. Other types of location-based VR, like The VOID and Dreamscape Immersive, however, have roll-outs planned heading into 2019 for a caliber of immersion that is unattainable at home. Some of those locations are in the highest foot traffic areas on the planet with brands like Ghostbusters or Star Wars offering exclusive experiences meant to draw people in — so we will be curious to see how those perform over time. The post IMAX VR Is Dead appeared first on UploadVR. Borderlands 2 VR officially releases on PSVR tomorrow, December 14th, but you can read our full review of the game already right here. It’s a decent port of a great game that retains much of what makes the original so special, but it’s missing a few key things such as the great DLC, co-op support, and Aim controller support. Either way we enjoyed it and are excited to show it off today via livestream! You can see our most recent past archived streams over on the UploadVR Twitch archive right here. There’s lots of good stuff there! Let us know which games or discussions you want us to livestream next and don’t forget to follow the Twitch channel and sign up for notifications. The post Borderlands 2 VR Livestream: Looting And Shooting Across Pandora appeared first on UploadVR. The post The Best Oculus Go Apps For A Memorable Holiday Weekend appeared first on VRScout. Build Your own VR Ride as RollerCoaster Tycoon Joyride Arrives on PlayStation VR Do more than just ride rollercoasters in Atari's latest title. The post Test Your Puzzle-Solving Skills In This AR Escape Room appeared first on VRScout. IMPORTANT DISCLAIMER: sideloaded apps are by definition not vetted by Oculus. You install them “at your own risk”, as they could affect the security or stability of your headset. VR Apps: these are VR apps just like you’d download on the store, except either the developer didn’t want to put it on the store or Oculus rejected it. Android TV Apps: these are media apps or simple games made for TVs. They will be displayed in the app list on the virtual screen in Oculus TV. Android Phone Apps: these are regular Android apps meant for phones. You may have some input problems with them as they were designed for touchscreens. To see these apps in your Go, you’ll need TvAppRepo (listed below). The Oculus Store has a great Netflix app to let you watch all the company’s shows on a virtual screen. But this app is based off the TV build of Netflix, and that’s missing one important feature: downloads. Televisions don’t tend to have much storage, so this feature wasn’t needed. But your Go has gigabytes of storage just waiting for your favorite movies & TV shows. First released in 1996, Quake is one of the most important first person shooter (FPS) games in the history of the genre. Quake was a huge leap forward, introducing new locomotion concepts such bunny hopping, strafe jumping, and rocket jumping. Over 20 years later, you can play the entire game on your standalone VR headset. However, keep in mind that Quake’s fast pace will defeat all but the strongest of stomachs. If you get VR sick at all, avoid this title. Fun fact: Quake’s lead programmers were John Carmack (Oculus CTO) and Michael Abrash (Oculus Chief Scientist). This makes Quake a perfect match for Oculus Go, the headset which was Carmack’s pet project. At the top of the article we’ve listed the 3 different types of apps you can sideload on your Go. However, to be able to actually launch any of the regular Android phone apps, you’ll need TvAppRepo. This is a useful app which allows you to generate Android TV shortcuts for these apps, and thus view them from Oculus TV. It also has a list of Android TV apps which you can download. If you’re having trouble with this app at any time, hit the back button on your controller as this usually fixes the issue. Netflix’s biggest competitor, Prime Video, is also available on the Go through sideloading. If you’re a Prime member this will give you access to thousands of movies & TV shows at no cost, and the ability to rent or purchase thousands more. The post 10 Great Apps & Games You Can Sideload Onto Your Oculus Go appeared first on UploadVR. Unity 2018.3 Arrives, Adding new Prefab workflows & Haptics APIs for VR Controllers Or you can even sign up to the Unity 2019.1a alpha. Review: Borderlands 2 VR Gearbox Software finally makes its VR debut, and it’s a blastingly good time.